Summer, the perennial season of love and youthfulness, makes a strikingly perfect setting for a wonderful wedding celebration. Such were our sentiments here at SDE Weddings, Toronto’s premier wedding videography, cinematography and photobooth group, just this past July 26th, 2014 while filming for the long-awaited wedding day of Tina & David, a young couple from Brampton who held their menagerie of marital memories at the esteemed Riviera Parque Convention Centre in Vaughan. Tina & David’s story recanted through second-hand whispers shows a particularly saccharine tale; of school-girl crushes and classroom curiosity. Beginning in the packed lecture halls of Tina & David’s shared classes yet finding its fateful way to a tender scene in front of a full crowd of family and friends, and the professing of a shared love that’s brought the two together ever since. 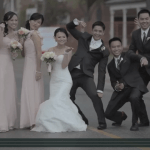 For our videographers and cinematographers, such a storybook tale fits together perfectly with the scenes we had captured during Tina & David’s wedding day. To top it all off, a specially-made photobooth care of yours truly was provided for the couple and their many varied guests, to, of course, predictably playful results. 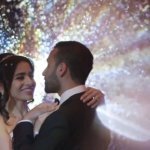 Scroll further to view our specially prepared highlight reel of the day’s events and to learn more about our videographers’ and cinematographers’ fantastic filming experience with Tina & David and their unforgettable wedding day. “Make sure you love and cherish each other every moment that you have”, a phrase simply stated at Tina & David’s reception struck us in hindsight as being the overarching theme of what brought together every piece and scene our videographers had filmed throughout the day. Tina & David’s chemistry together was immaculate, and the two seemed rightfully inseparable in many of the scenes our videographers took. The moment of truth, the ring exchange, was an understandably sentimental scene – featured in the highlight reel – of Tina battling a seemingly spurn of the moment case of sniffles, or perhaps completely overcome by emotion, as the two exchanged vows. Fashioned with wide-eyed grins that matched the other’s perfectly, only to soon after meet one another in a kiss to define a lifetime. 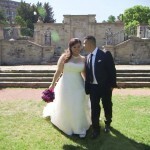 Outside of a brief interlude at the Etobicoke Creek Trail, many of our videographers’ favourite shots took place at Vaughan’s Riviera Parque Convention Centre, where Tina & David opted to host both ceremonial services and the reception afterwards. 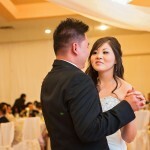 With a varied multicultural crowd of faces of all ages and nationalities, we knew for certain that Tina & David’s celebration was markedly ‘Torontonian’, coming from the union of two first-generation immigrant families from different backgrounds – Tina being Vietnamese and David being Chinese-Filipino. Altogether, it was a vibrant multicultural vibe we thoroughly enjoyed throughout the night. 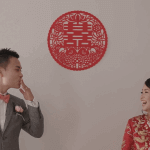 Indeed, culture played a crucial part in the wedding’s proceedings, with a serving of tea to the elders in deference to family and tradition and Tina fashionably fitting-on a bright-red Ao Dai for the evening’s fanciful reception. A lovely first-dance surrounded by star-struck onlookers would be the Pièce de résistance of the evening, along with a shot of the couples’ first kiss as shutters of surrounding cameras add a glistening to the scene. A shot our videographers were quite proud of was of the couple, hand-in-hand, together making the first slice through their wedding cake – a bit messy, with a fumbled feeding of a mouthful of cake between the newlyweds – was a candid moment captured, and sealed hereafter with a kiss. 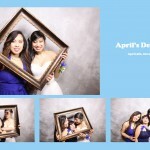 We had also provided a photobooth experience for Tina & David, which was open to the couple and their guests from the first moment of the reception to the very last. You can preview a few of the more outlandish and ostentatious photographs of the newlywed and their fellow celebrants in several of the attached photos of this post. In the end, an open ballroom shot of the night’s incredible ethereal atmosphere says it all. A shot we’re very proud of, in both film and editing, shows that a scene is only worth as much as those who help create it; a truism for every scene we took. And no doubt, Tina & David’s unmatched energy on a day as enormous as their wedding was a sight to behold. We here at SDE Weddings, Toronto’s premier wedding videography, cinematography and photobooth group, are utmost grateful to Tina & David for choosing us to document their day together, and we hope that the two would treasure our gift to them of their unforgettable marital memories for many years to come.